Drivers near Dallas, Irving, and Grand Prairie, TX, in search of a family-friendly sedan that provides a spacious and comfortable ride should consider all of what the 2018 VW Passat and Kia Optima have to offer. Distinctive styling combines with precision engineering to create two vehicles that consistently rise to the top of their class. The big question you need to ask yourself is, which is best for me? 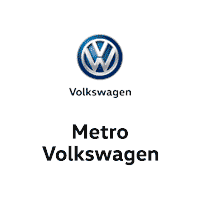 At Metro VW, our team is committed to providing drivers with the best information on our full line of VW models. Continue reading this helpful comparison to see which performance sedan takes the top spot! 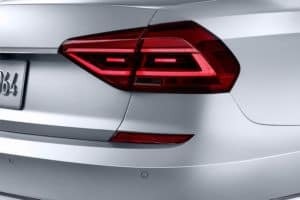 The 2018 Volkswagen Passat comes in seven distinct trim levels, offering two performance engine options to match your particular driving style. The base trim comes standard with an athletic 2.0L turbo engine that can produce up to 174 horsepower, while higher trims offers a robust 3.6L V6 engine that packs up to 280 horsepower. All this power is seamlessly controlled by a 6-speed automatic transmission with built-in Electronic Stability Control along with Sport mode and Tiptronic®. These technologies create seamless acceleration along with an ultra-smooth ride. Meanwhile, the Kia Optima offers five trim levels and comes standard with a 2.4L 4-cylinder engine that can reach the 170-horsepower threshold. Like the VW Passat, the Optima comes standard with a 6-speed automatic transmission with a Sportmatic® Sports Shifter that helps improve handling while maneuvering around sharp curves in the roads. 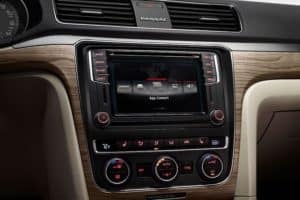 The 2018 VW Passat interior cabin looks and feels like an upscale sedan, with elegant wood-textured trim and refined aluminum accents. There’s loads of headroom and legroom for its five passengers to enjoy, as well as 15.9 cubic feet of trunk space. Lower the 60/40 split rear seat pass-through to quickly load up for a week at the beach. Plus, it comes with advanced features like Volkswagen Car-Net® App-Connect, which connects to all your favorite apps and streaming services. For its part, the Kia Optima provides a roomy cabin with soft-touch materials throughout with stylish features, such as an available leatherette instrument panel and door trims. Standard convenience features include: a 7-inch touchscreen display, six speakers, rear-camera display, trip computer, and steering-wheel-mounted audio controls. Above all, your safety is the number one priority for both models, each coming with a suite of active safety features to help keep you out of harm’s way. It also comes equipped with a special hydraulic brake assist to help avoid hydroplaning and slipping during wet or icy conditions. Likewise, the Kia Optima provides standard safety features, such as: Vehicle Stability Management, Electronic Stability Control, Hill Start Assist, Tire Pressure Monitoring System, and an Anti-Lock Braking System. 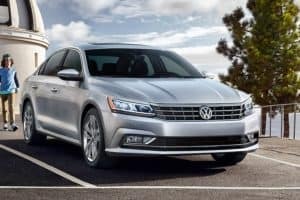 While this comparison has shown both sedans possess exceptional qualities, it’s clear that the 2018 VW Passat is the obvious choice. If you’re a driver near Dallas, Irving, or Grand Prairie who’s interested in taking a closer look, stop by Metro VW or go online and schedule a test drive today!